Yes very hungry! Love the bowl. Absolutely stunning! Fantastic work Debra. Hmmmmmm.... Soy sauce fried yellow noodles... Love it! 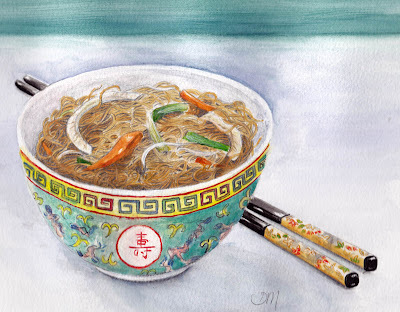 Beautifully drawn, blown away by the strings of noodles and all the details. Fantastic job Debra! Yum, I love noodles, but that bowl is sumptuous! Excellent job on the bowl and chopsticks! Well the noodles too but the bowls have so much texture and detail I can only say WOW again! It's gorgeous, and the details are extraordinary! So precise and realistic! Amazing! The noodles are so real! Fantastic detailed work! Those noodles are incredible! The whole drawing is.